The second day of RootsTech began with a very early start for the official Ambassadors – a behind-the-scenes tour of the Expo Hall at 7.30am! The Expo Hall was huge and to be given the opportunity to wander around to view and take photographs of exhibitor stalls without a massive crowd was a terrific opportunity. The Hall was divided into three main areas: Innovation Alley for showcasing new tech tools and products; the Discovery Zone – full of interactive displays and activities while you learn about your heritage; and the Demo Theatre – a place to sit and relax while watching exhibitor presentations and demonstrations. Two new highlights for 2017 were the addition of a Coaches’ Corner, where you could drop in for some one-on-one mentoring from an expert genealogist, and the Heirloom Show and Tell – a place to bring your antique, heirloom, or photo to, for an expert to look at. 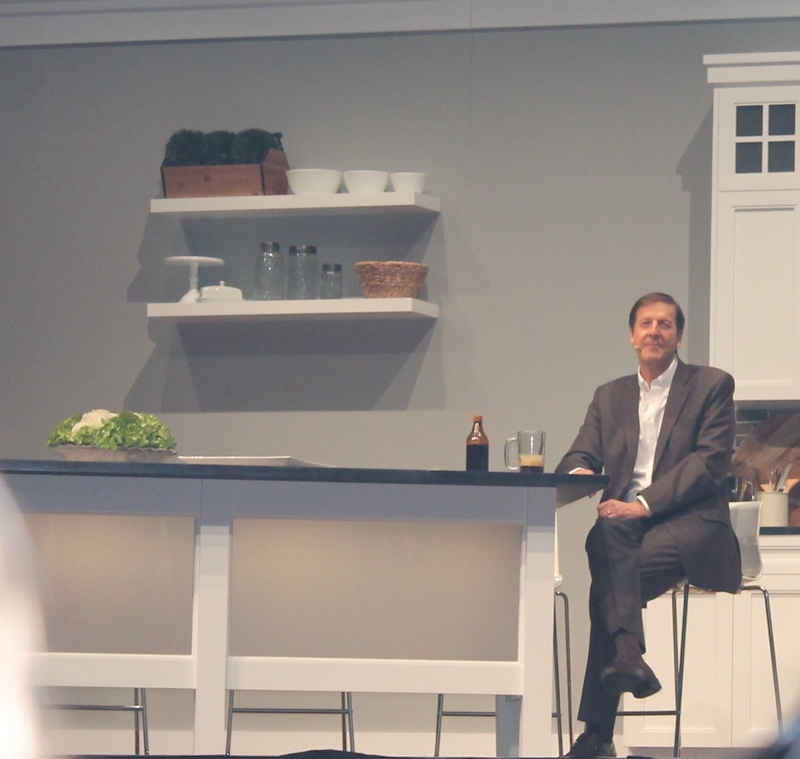 Following our tour of the Expo Hall we were seated for the Keynote session which began with Steve Rockwood, CEO of FamilySearch, talking about his family and the importance of food traditions within his family. 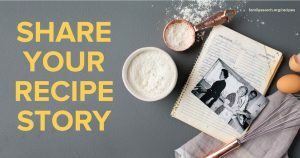 He then went on to launch a campaign whereby individuals can preserve and share family recipe stories at FamilySearch. 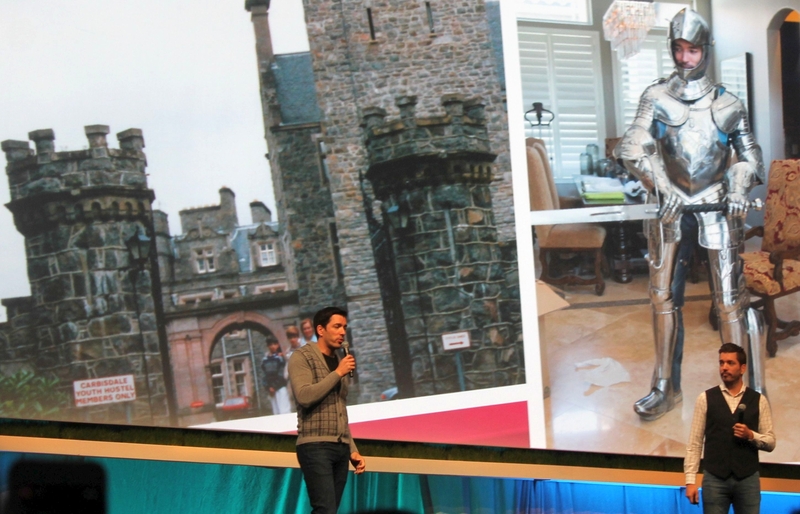 Steve was followed by the exciting Property Brothers – Drew and Jonathan Scott. 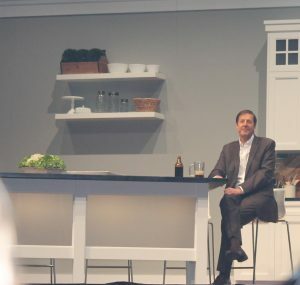 While I had never heard of these two before RootsTech, there were definitely several Ambassadors around me who went weak at the knees when they bounded onto the stage. And the Scott brothers didn’t disappoint. They were fast and full of energy as they told us hilarious stories of their home life and family holidays as well as why Jonathan learned to play the bagpipes. 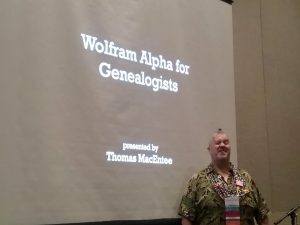 The first lecture I attended was on Wolfram Alpha for Genealogists and was presented by the renowned and highly entertaining Thomas MacEntee. He brings a presentation to life and thoroughly enjoys doing what he does best – helping others. Listening to the many merits of using Wolfram Alpha has certainly opened my eyes to new ways of researching the lives of our ancestors. In the afternoon I attended my other lecture for the day – that of Researching Your European Ancestors Online by the IntoThePast team. The evening’s entertainment was performed by the Mormon Tabernacle Choir and guest soloist Dallyn Vail Bayles. Unfortunately, I was a last minute cancellation having received some worrying news from home but everyone I spoke with, who had attended, advised it was a huge success. Entitled Music – It Runs in the Family, it was held at the LDS Conference Centre on North Temple Street and was a mixture of music and stories of the Rodgers & Hammerstein legacy. 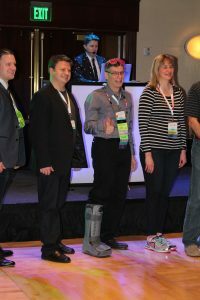 This entry was posted in News, RootsTech 2017 and tagged RootsTech 2017 on March 9, 2017 by Jennie. 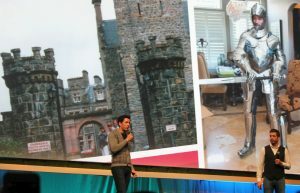 Wednesday began with the Innovator Summit General Session. The keynote speaker was Liz Wiseman, president of The Wiseman Group that teaches leadership to executives and emerging leaders around the world as well as workshops and development programs. Liz Wiseman is also a bestselling author of three books and contributor to Harvard Business Review, Fortune and Wall Street Journal. Liz was someone I had never heard of before, being from outside the USA, but WOW what a motivational speaker! She wasn’t a feminist pushing her success down your throat and she also wasn’t a corporate bully telling you what you have to do to succeed. But what she spoke about was amazing, including, that not everyone is a genius but everyone has genius and how we can evolve it. I was so totally impressed with her business and life standards that I chose to forgo my next genie session to sit in on her one-on-one interviews. And, therein, I had my own 5 minutes of fame when I was able to explain why smoke detector batteries always begin to chirp at night when the batteries are getting flat. As soon as I arrived home I purchased her best-selling book, Rookie Smarts. There was no way, however, that I would forego my next session. It was time for the exciting Innovator Showdown Semi-Final. I wrote previously of the ten semi-finalists that had been whittled down from an initial 42 entries so I won’t repeat myself here with that detail. 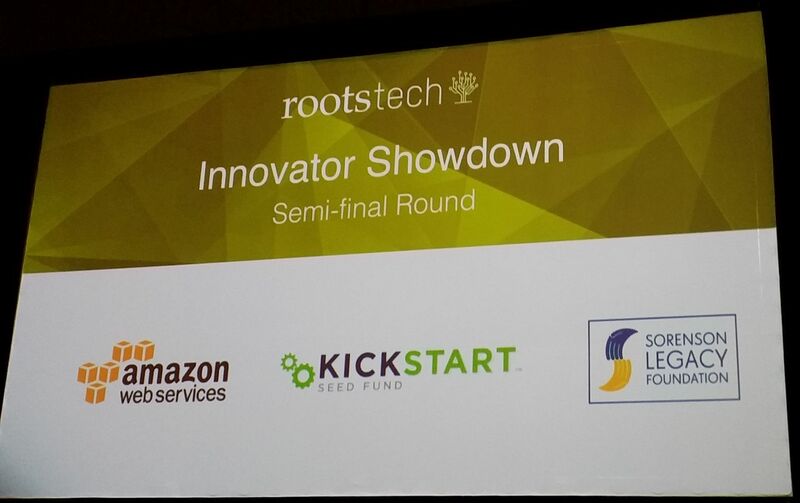 For now, the Innovator Showdown Semi-Final required each of those ten finalists to promote their software innovation in a 2-minute pitch in front of a 5-man judging panel. As each innovator took the stage it was easy to see that all were worthy of a place in the final. However, only five finalists would proceed to the Innovator Showdown Final to be held on the Friday of the conference. 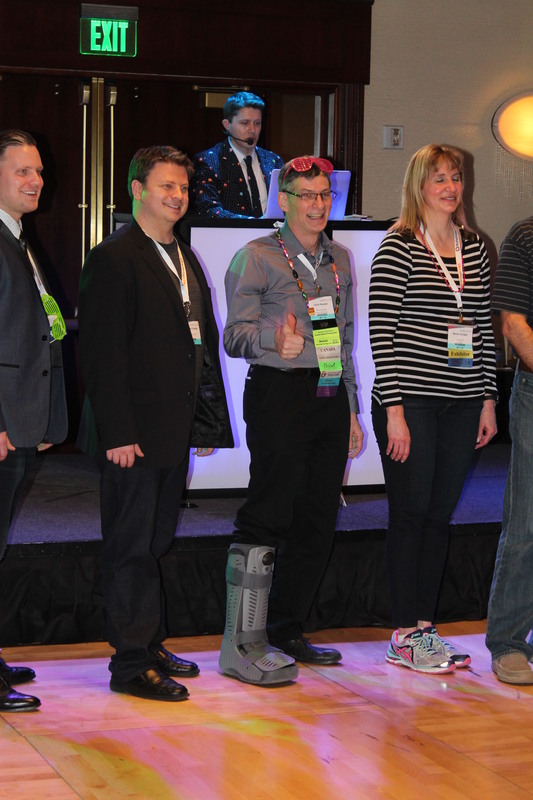 No doubt the ten finalists spent an anxious afternoon waiting for the official announcement to be made that evening, during the RootsTech Welcome Party, of who would be the five finalists. In the afternoon I attended a booked Lab session on Palaeography. 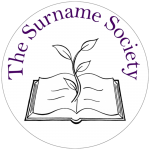 Even though I am already fairly skilled with palaeography, I still managed to come away with one or two new ideas and thoroughly enjoyed myself. I felt the standard of this Lab session was very good but speaking later with many advanced genealogists attending RootsTech it appears not all Lab sessions were as good – especially for those who had booked sessions expecting advanced teaching but receiving only basic education. The evening entertainment event was the 80s-themed Welcome Party held at the Marriott Ballroom opposite the Salt Palace Convention Centre. The entry to this function certainly didn’t go as smoothly as planned but putting that aside it was a great evening to unwind among friends. Jason Hewlett did another fabulous job as MC, thrilling us with his Michael Jackson impersonations among many others. Lots of small prizes were also given out for all manner of competitions including dance and karaoke. However, the moment we were all waiting for – the announcement of the five finalists for Friday’s Innovator Showdown. And the winners were: Emberall (Capture, organize, store and share the life history of a loved one – from your smartphone in as little as 30 minutes); Kindex (Accessible, searchable archives for everyone through collaborative record sharing and indexing); Double Match Triangulator (An autosomal DNA analysis tool for genealogists); OldNewsUSA (The easiest way to find your family in historic newspapers – on your phone); and QromaTag (Add your story to any photo using your iPhone and your voice). Congratulations to all who participated. This entry was posted in News, RootsTech 2017 and tagged RootsTech 2017 on February 25, 2017 by Jennie. 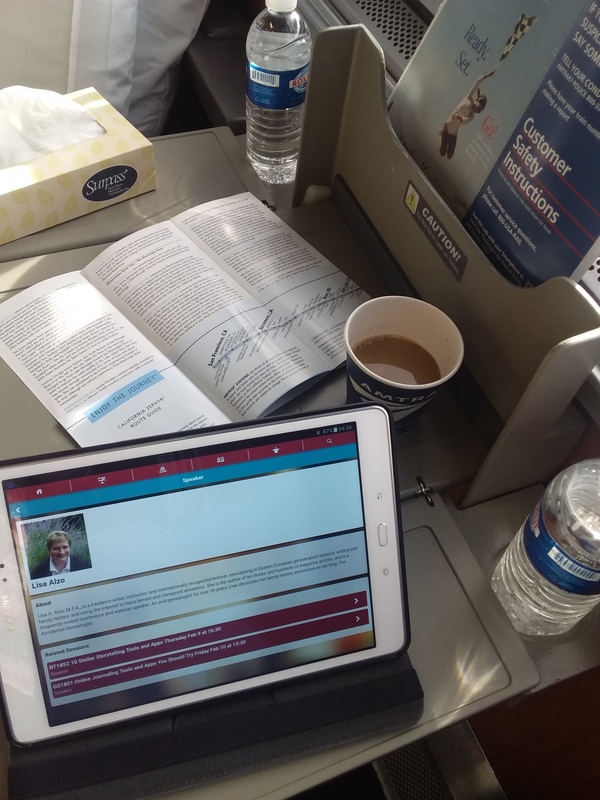 If there is one thing I have learned from attending my first RootsTech conference in Salt Lake City, Utah, it is – you cannot physically do everything! 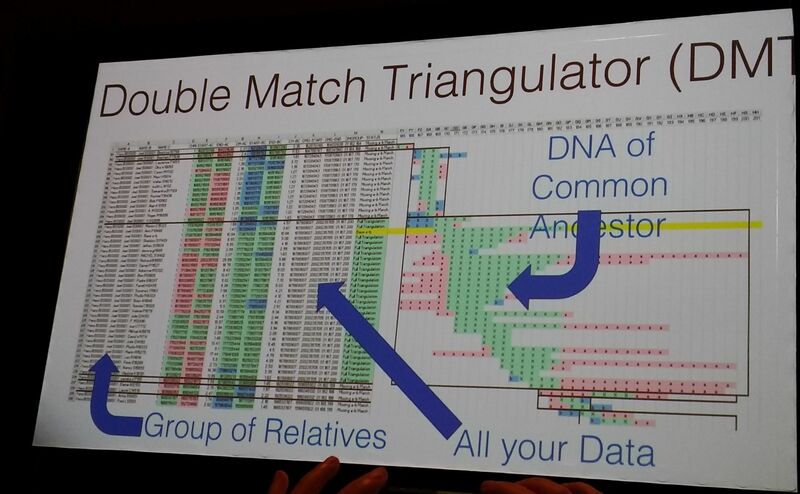 So … how did I spend my time as an Ambassador at the world’s largest genealogy conference? Well, it all now seems such a blur but I know I was definitely there and it was just the greatest time ever. 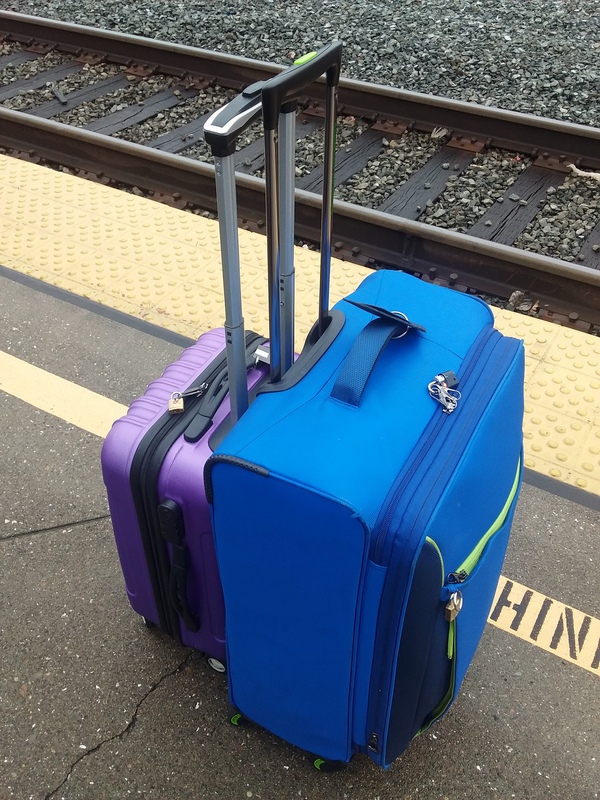 I began my journey from Sydney, Australia, by flying into San Francisco to allow me to travel on the California Zephyr to Salt Lake City. 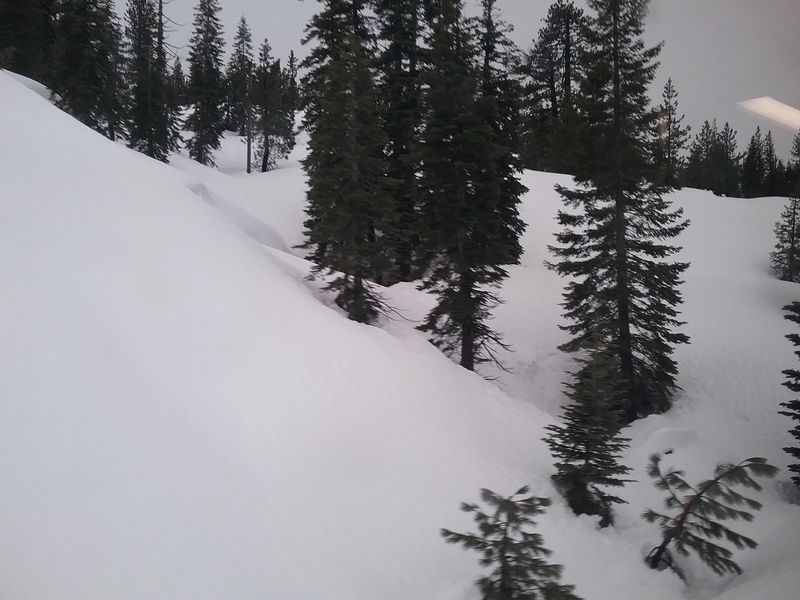 This was a great decision, giving me time to view some wonderful countryside I wouldn’t have otherwise seen from a plane, with the highlight being the thickly-covered snow-capped Sierra Nevadas of the Rocky Mountains. 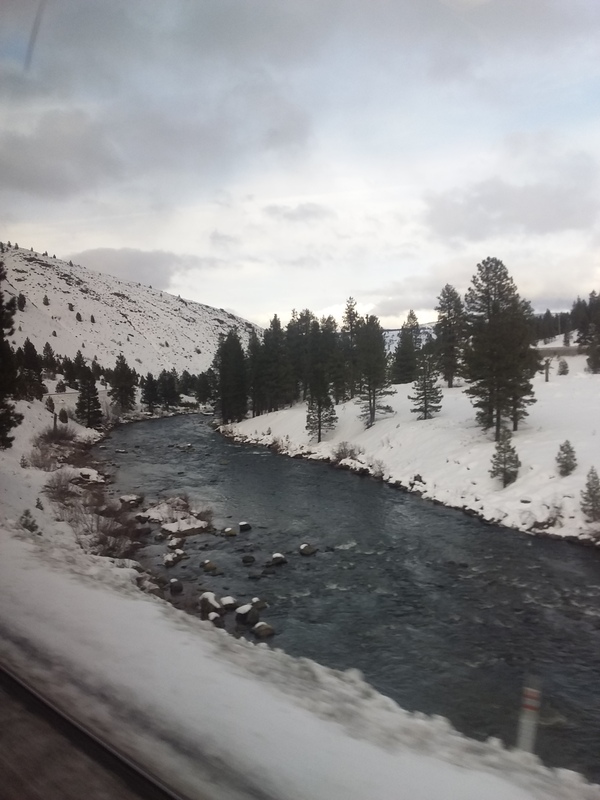 I would definitely do this train trip again but I would break the journey and stop off overnight at Truckee, California. 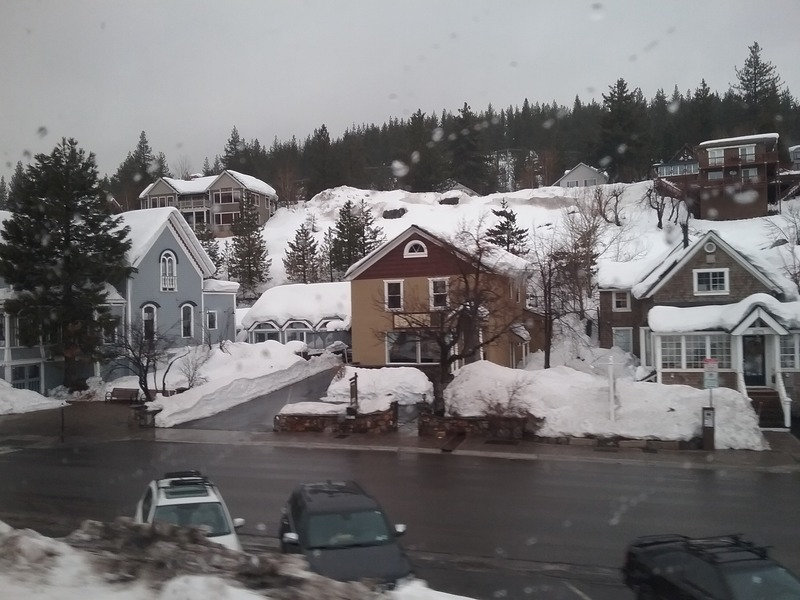 With snow and icicles abounding, Truckee was the ultimate picture-postcard village. I arrived in Salt Lake City on the Friday prior to the Wednesday, 8 February, kick-off of RootsTech. 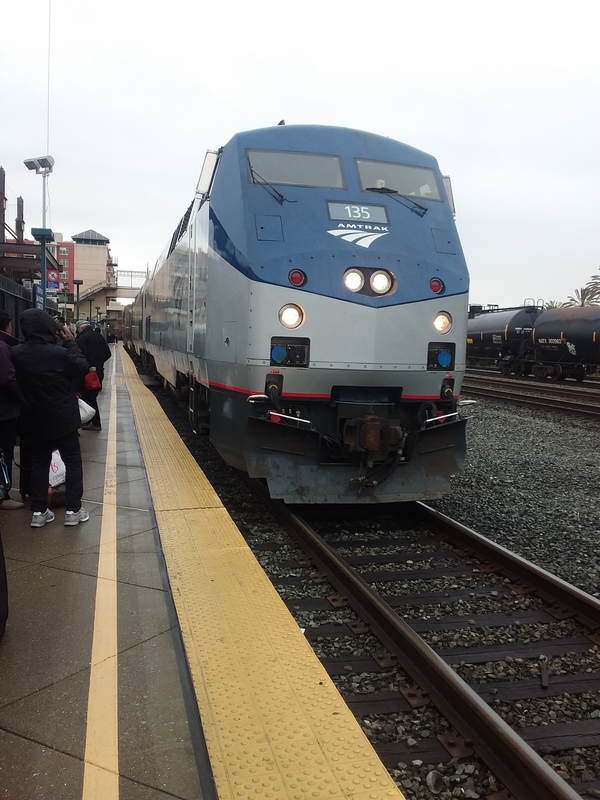 In fact, I arrived at 4am on the Friday morning – the only drawback of travelling to SLC by train. However, I had thought ahead and booked my accommodation in SLC to start from the Thursday night enabling me to go straight to my room, drop my gear and catch a few more hours sleep. 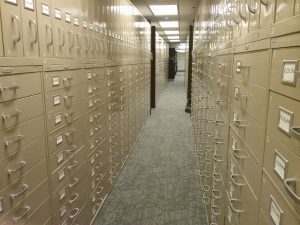 After waking, showering, breakfasting, and, armed with a long list of microfilms and books I wanted to look at, my early arrival in SLC allowed me to reacquaint myself with the wonderful Family History Library. I wasn’t long in the FHL before I found Helen Smith, from Brisbane, Australia, who was not only attending as an Ambassador but also speaking at RootsTech and who was also hard at work in the library. And while, I wasn’t able to catch up with Helen later, for dinner that night, I did catch up with RootsTech Ambassador Extraordinaire, Jill Ball – a fellow Sydneysider attending her 6th out of the seven RootsTech conferences held to date. 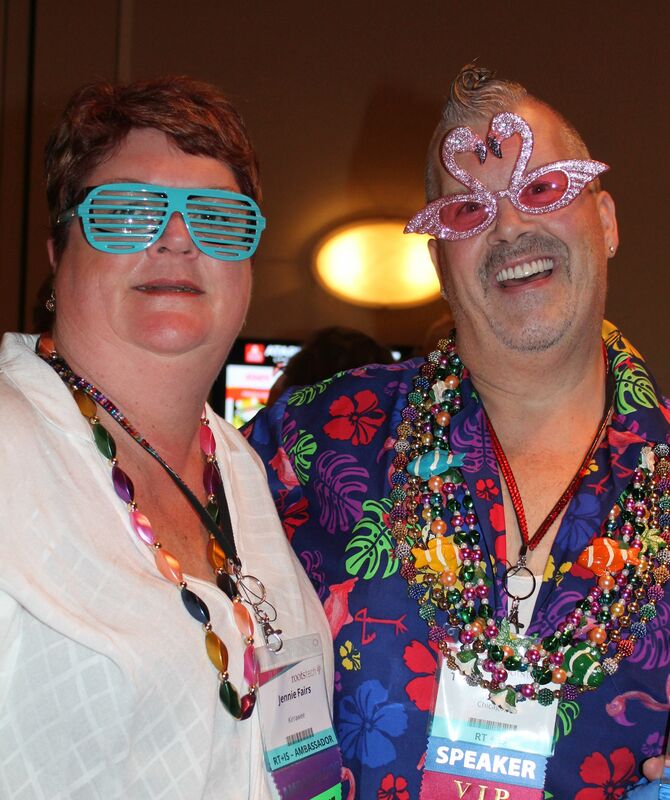 Jill is better known as Geniaus and is a true inspiration to all genealogists, and not just DownUnder. We dined at Kneaders Bakery & Café and I am so very thankful that Jill held my hand as an older sister throughout my first RootsTech attendance – thank you, Jill. Saturday saw me back at the Family History Library, bright and early, and throughout the day I met up with several more Australian & US genies who were also in town to attend RootsTech –Melissa Hulbert (Sydney), Kerry Farmer (Sydney), Alona Tester (Adelaide), Mary Kircher Roddy (Seattle, WA), Jenny Joyce (Sydney) and Lilian Magill (Sydney). Following a full day of research it was really great to have a quiet dinner with Helen Smith and Alona Tester at JB’s Restaurant that night. Sunday, for me, was a little sleep-in followed by a short stroll around the City Creek shopping district of SLC (sadly all closed). I again met up with Helen and Alona for lunch back at JB’s followed by dinner at The Cheesecake Factory with a whole bunch of Australian and New Zealand genealogists. The Cheesecake Factory in USA is nothing like its namesake back in Australia. 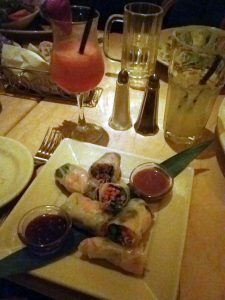 In the USA you can order all manner of food and I enjoyed a wonderful appetiser of Vietnamese Shrimp Summer Rolls. Those in attendance included: Alona Tester, Jill Ball, Roger Moffat (ex-NZ) & Lisa Christensen, Lilian Magill, Kerry Farmer, Melissa Hulbert, Jenny Joyce and Fran Kitto (Queensland) – the night ended up being a pre-Commonwealth dinner! 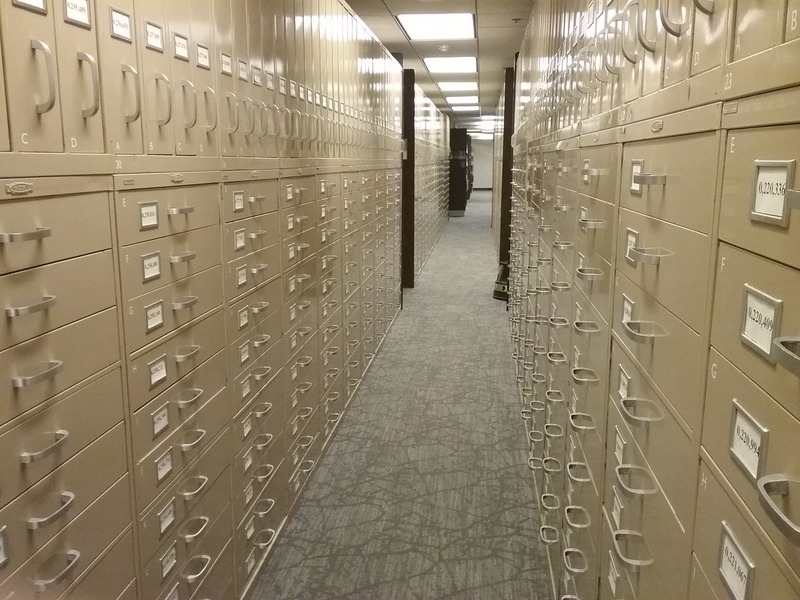 Monday was another day back at the Family History Library with all of the above mentioned genie friends searching through various microfilms and electronic databases. However, first-up, we all met on Level 3 at the FHL to take part in the highly popular Monday’s With Myrt genealogical program. 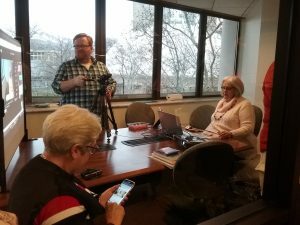 Pat Richley-Erickson is the genius behind Dear Myrtle and it was a huge honour for me to be interviewed by her live-on-air as well as receiving a set of fabulous blogging beads confirming my place at RootsTech as a GeneaBlogger. Another highlight was meeting Thomas MacEntee – a major worldwide genealogical name – and the inspiration behind my own recent weight-loss surgery. The kick-off to RootsTech for those from British Commonwealth countries officially began on Monday night with a superb get together at the Blue Lemon Restaurant organised, once again, by Jill Ball. Added to the above Down Under attendees were many more genies from the Commonwealth including Martin Killion (Sydney), Jan Gow (New Zealand), Alan Phillips (Adelaide), Heather Garnsey (Sydney), Carole Steers (England), Audrey Collins (England), Graham Walter (ex-Aussie now England), Steve & Diana Fulton (Canada) and Ruth Blair (Canada). What a wonderful combination of worldwide people united by the same interest – genealogy. 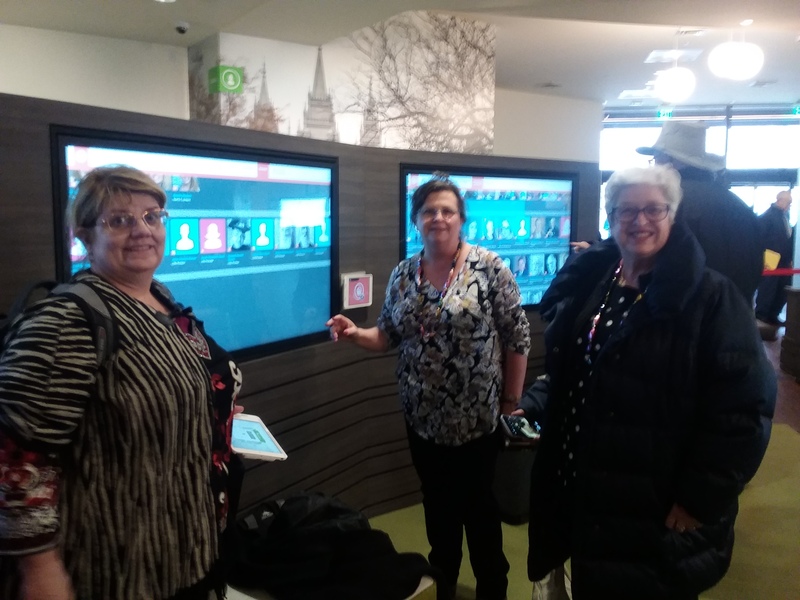 So, on to Tuesday – the start of official Ambassador duties at RootsTech and, while I was able to conduct a little more research early in the day, at 2pm the RootsTech Ambassadors enjoyed a VIP tour of the Family History Library’s newest interactive discovery experience. The new attraction opened to the general public on 8 February, and, from what I previewed, I am sure that everyone who visits will enjoy the experience. 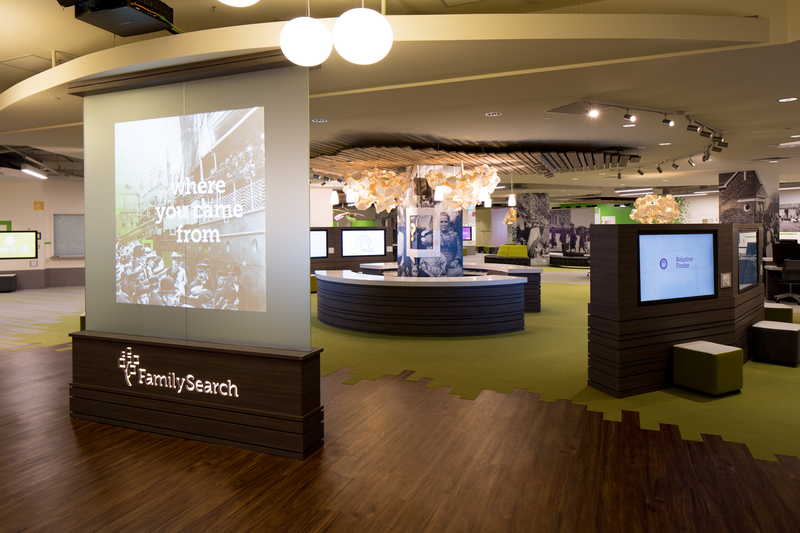 With something for young or old, the innovative technology is designed to introduce guests to the fun side of their genealogical discoveries. The final event for the day – well for the RootsTech Ambassadors – was the Media Dinner. 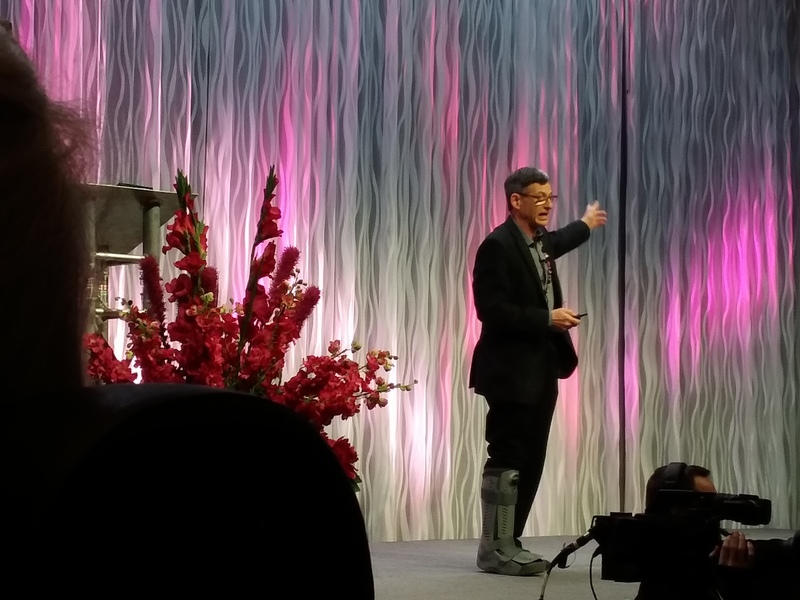 As a first time attendee I was overwhelmed by the friendliness, camaraderie and celebration of being at RootsTech. And they couldn’t have asked for a better MC for the evening than Jason Hewlett – a consummate speaker, entertainer, author and impressionist with a “clean”, family friendly comedy. And I have to say, that his impression of the Bee Gees absolutely floored me! 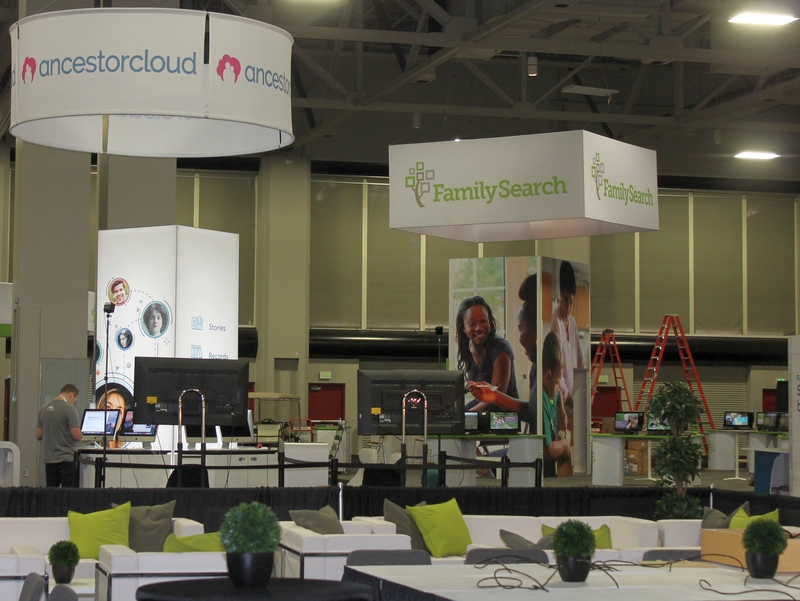 This entry was posted in News, RootsTech 2017 and tagged RootsTech 2017 on February 19, 2017 by Jennie. Gosh. Where has the time gone? I have suddenly realised that in just over 6 weeks I will be in Salt Lake City for my first RootsTech conference! When it was confirmed that I would be an official Ambassador for the event I had months to plan my trip – now I can see the next 6 weeks disappearing before my very eyes. I’ll be arriving a week earlier, on 2 February, so that I can spend time researching at the wonderful Family History Library. The last time I was there, in 2010, I spent 4 whole days in Basement 2 which houses the British Isles collection. This time, I am hoping to at least visit one or two of the other 4 floors before RootsTech kicks off on 8 February. But for now, what is turning out to be my biggest drama is, what clothing will I take? I’ll be leaving Sydney at the height of our Australian summer and arriving in Salt Lake City, at the height of their winter. I think I am pretty well covered for the outdoor side of things – running (or will I be skiing) from accommodation to the Salt Palace Conference Centre or the Family History Library – but I’m not sure what to take for the indoors. Layered clothing sounds good but do I layer down to short sleeves or long? All my besties know how much I hate the heat so I am currently leaning towards short sleeves for indoor activities. However, I will probably have to draw the line at shorts and thongs! 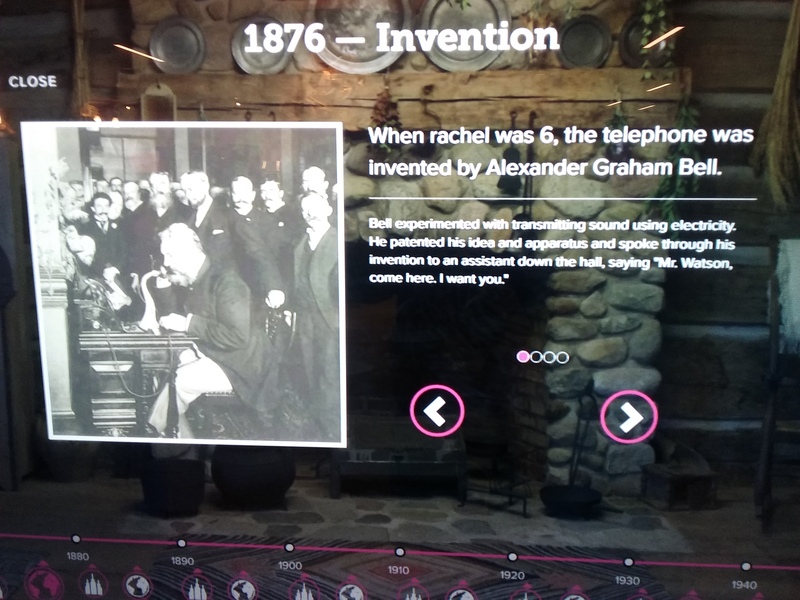 This entry was posted in News, RootsTech 2017 and tagged RootsTech 2017 on December 18, 2016 by Jennie. Want to Visit RootsTech 2017 with a Friend? 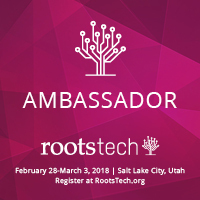 A bonus of being an Ambassador for RootsTech 2017 is the fact I get to give away one complimentary 4-day pass to the event. However, I also realise that there might not be too many people in Australia clamouring for a single 4-day pass that requires airfares, accommodation and meals to be added at personal cost. So, instead, I got together with recently crowned Gold Rockstar Genealogist, Kirsty Gray, and we’re offering a DOUBLE 4 DAY-PASS. After all, what better way to attend RootsTech 2017 than with a friend! All you have to do is leave a comment on either Kirsty’s post of 6 Nov 2016 or on this post naming who you would like to take to RootsTech 2017. And, if you or your friend has already booked and paid for RootsTech 2017 you can still enter the draw and, if you win, a refund of your registration fee will be made by the organisers. But, remember, getting to and staying in, Salt Lake City is at your own expense so please only enter if you are serious – and make sure your nominated friend also enters to double your chance of winning. Disclosure: Both Kirsty Gray and Jennie Fairs are RootsTech 2017 Ambassadors and received complimentary registration to RootsTech 2017, however, travel to and from RootsTech, accommodation etc is at their own private expense. This entry was posted in News, RootsTech 2017 and tagged RootsTech 2017 on November 7, 2016 by Jennie. 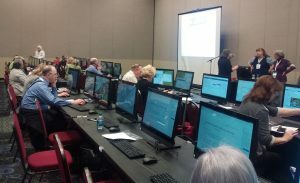 With the announcement of the official opening of registrations for RootsTech 2017, came a bright and colourful new website and publication of sessions and labs available throughout the conference. The 4-day conference will offer attendees a full line-up of inspiring and well-known keynote speakers with more than 200 Breakout Sessions covering DNA, Tools, Photos, Stories, Organising and Discovery, including hands-on computer labs taught by industry professionals and leaders. Heirloom Show and Tell where you can bring in any small item or photo of a large item you’ve been wondering about, and they’ll tell you about it. 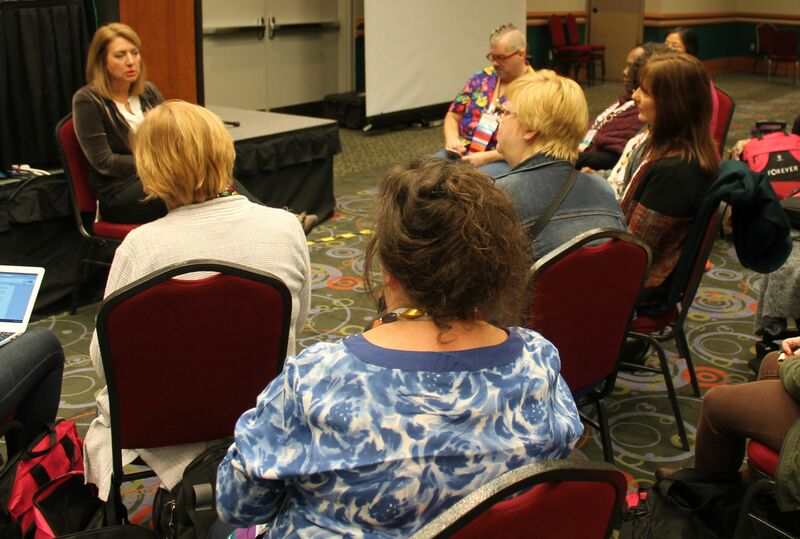 Early bird discount pricing is available for a limited time with 4-day passes at just $159 and $189 for the RootsTech plus Innovator Summit pass. Passes for the Getting Started track start at $49 for a single day and $69 for a limited 3-day pass. All passes include access to the popular expo hall and morning keynote sessions. This entry was posted in News, RootsTech 2017 and tagged RootsTech 2017 on September 18, 2016 by Jennie. Last week I received confirmation that I have been accepted as an official Ambassador for RootsTech 2017. After doing a little happy dance through the house, I settled down and thought about what I would do in my role and realised I could take the 31 Days to Build a Better Blog challenge one step further and use the program to promote and discuss everything RootsTech. Today’s exercise is to write a list post. List posts can be an effective and popular tool for bloggers – eliciting easily scannable material for readers, they can be short and to the point yet comprehensive and succinct. And in the words of Jill Ball, plenty of geneagaggle! This entry was posted in 31 Days, RootsTech 2017 and tagged 31 Days, RootsTech 2017 on August 29, 2016 by Jennie.